The Sonoran Dogs — Laguna Beach Live! Formed in 2011, The Sonoran Dogs have exploded upon the bluegrass scene. The “Dogs” headlined the 2014 and the 2015 Prescott Bluegrass Festivals, and headlined the 2014 Tucson Folk Festival. They have performed at California’s Summergrass, Parkfield, and Blythe Bluegrass Festivals, and for the San Diego Folk Heritage. They also performed at the Reno Nevada Bower’s Mansion Festival, and Colorado’s Fruita Fall Festival. The Sonoran Dogs are regulars at Arizona festivals in Flagstaff, Sedona, Tucson, Marana, Wickenburg, and Casa Grande. The group is made up of seasoned veterans who have come together to enjoy bluegrass music and friendship. They play a collection of traditional bluegrass standards, new-grass, Americana, folk, Celtic, and original compositions. Every concert is different, as they often improvise the set to follow the mood of their audience. It makes for a fun and dynamic show! PETER McLAUGHLIN-guitar/vocals Peter started playing the guitar at the age of eight and was very soon jamming at early bluegrass festivals and fiddler's contests. Several years later, Peter started entering guitar contests, and he eventually went on to take top honors at the National Flatpicking Championship in Winfield, Kansas in 1988, after taking second place there in 1986. Peter has also played music with banjo player Ross Nickerson in various bands, including the Titan Valley warheads. In 1991 Peter again met up with Tom Rozum and joined Laurie Lewis, touring nationally and internationally for six years as guitarist and harmony vocalist with her band. In 1992. Chris Brashear moved to Tucson. He and Peter struck up an immediate and lasting friendship with a strong musical bond. In 1995, Peter released his first solo album, a CD entitled “Cliffs of Vermilion", produced by Laurie. She, along with Tom, Chris, Peter's brother David, and father Bill and others appear on Peter‘s stellar CD. Peter is a 2013 inductee to the Tucson Musician’s Museum in the Bluegrass/Americana category. MARK MIRACLE-mandolin/vocals Mark has been playing music all his life in the southwest US region; having played concerts in Arizona, California and Colorado. Mark has won numerous mandolin contests, and his band, Shady Creek, won the SW Regional Division of the PIZZA HUT Showdown (now lBMA) Battle of the Bands in the late ‘90’s. Mark is also the founding member of CLEAR , which won the Telluride Band Contest in 2000. They were invited to open the festival in 2001. He also spent 5 years in Ohio, playing in 3 bands and extensively touring the area. His return to AZ brought him to becoming a founding member of Sawmill Road, touring throughout the US, Canada, and Europe and producing 2 stellar recorded projects. "Sawmill Road 1" and “Sawmill Road - Fire On The Kettle". TYLER JAMES (Walls)-banjo, vocals Tyler who comes from a musical family, started playing music at a young age. After experimenting with several different instruments, he received a banjo on his fifteenth birthday and immersed himself in bluegrass music. In 2008, he "came up for air", competing in and winning--the Rockygrass Banjo Championship in Lyons, Colorado. He went on to take 1st place in the Arizona Banjo Championship that same year. Tyler did it again, winning the 2010 Huck Finn Festival banjo championship and attaining top 5 finalist status at the Winfield National Banjo Championship. BRIAN DAVIES-upright bass/vocals Brian is a founding member of the TAMMIE award winning Crystal Ridge Bluegrass Band. Brian honed his skills in the LA. rock scene, and has done session work for A & M records, toured as an opening act for Peter Frampton, Missing Persons, and most recently opened concerts for Ralph Stanley, Sam Bush, Roger Clyne and the Peacemakers, with his various rock, bluegrass and zydeco bands. 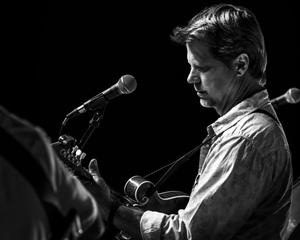 Brian has produced and engineered several CD projects for Arizona artists, and in 2008, co-produced and co-engineered a project with special guests Sam Bush, John Cowan, Roland White, Brad Davis, and Peter Mclaughlin. Brian has also engineered soundtracks for the local Tucson television programs "The Desert Speaks" and "Man Alive." First runner up in the “Bass” category for the Tucson TAMMIE Awards in 2004, Brian is a regular KXCI 91.3 FM community radio underwriter through his dental practice.